ReadKit is a combined RSS and read later Mac app that offers a number of promising features that are quite suitable for any serious newsreader user. In addition to working as a standalone RSS reader without any sync services, ReadKit offers support for a number of RSS, Read Later and Bookmark services. The supported services include Feedly, Fever, NewsBlur, Feedbin, Feed Wrangler; Instapaper, Pocket and Readability; Pinboard and Delicious. ReadKit is essentially a unified app where you can do all your reading in one place and can easily drag and drop items between the registered accounts. After reading quite a number of good reviews and recommndations online, I decided to purchase the app and give it a try. ReadKit offers a great reading experience. The user interface is an elegant 3-column layout with four different themes and is overall quite suitable for serious reading. One of the best features is the Focus mode that hides all the columns and displays article in one window without the annoying page elements. ReadKit also supports fetching of full text only version of an article. Reading experience can be further customised by changing the article font style, face, alignment, height, line spacing and page width. However, the text font in the first two columns cannot be changed. The app is feature-rich with support for feed import via OPML format and folder creation and management for built in RSS, tagging of read later articles, customized smart folders (a powerful feature, indeed), article search, sharing of articles via Facebook, twitter, Messages and Email. Articles can also be saved to Safari Reading List, Evernote or sent to Pocket, Instapaper, Readability; Pinboard and Delicious. However, all these feature are only useful if you are lucky enough to have the app work without bugs on your machine! My disappointment with ReadKit started when I initially started using the built-in RSS engine without registering any of the third-party RSS services in the app. I was successfully able to import feed subscriptions via OPML with the folder structure intact. However, all my articles marked as read would again be marked as unread on re-opening the app. Moreover, items in the ‘RSS Starred’ folder would also go missing! 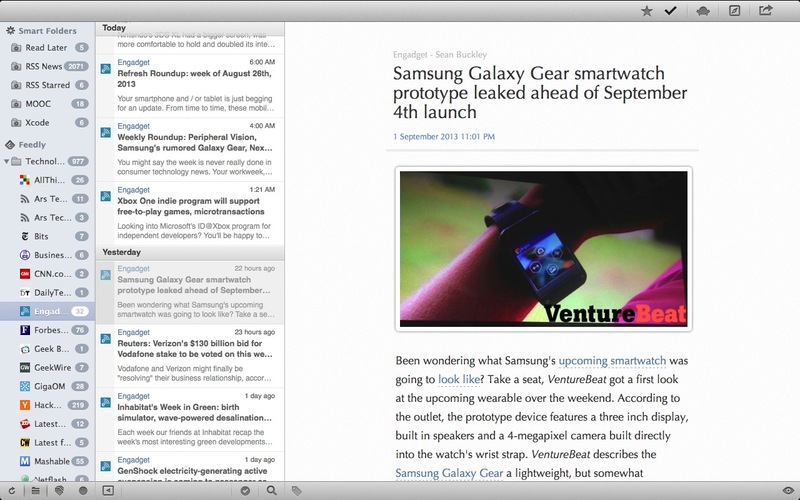 I had been using Vienna before and it works wonderfully well as a standalone RSS reader. Quite frustrated, I removed the standalone RSS feeds and then registered Feedly and Pocket accounts. It appeared to work fine until I tried quitting the app - I received ‘Multiple Validation Error’ message followed by the following dialling box. Clicking ‘Cancel’ in the above box would also have the same effect as clicking on the Quit button - the app would quit anyway! On restarting the app, my old OPML feed would show up in the standalone feed section with no trace of previously successfully registered feedly and Pocket accounts! After trying various permutations/combinations, I was finally successful by first removing the smart folders (!) that I had created earlier and then registering Feedly account. However, I would still not able to save articles to Pocket although it was successfully registered and was listed in the left-most services column of the app! I finally had to delete the app, search and remove all the app’s files by using Finder and re-install to make it work.